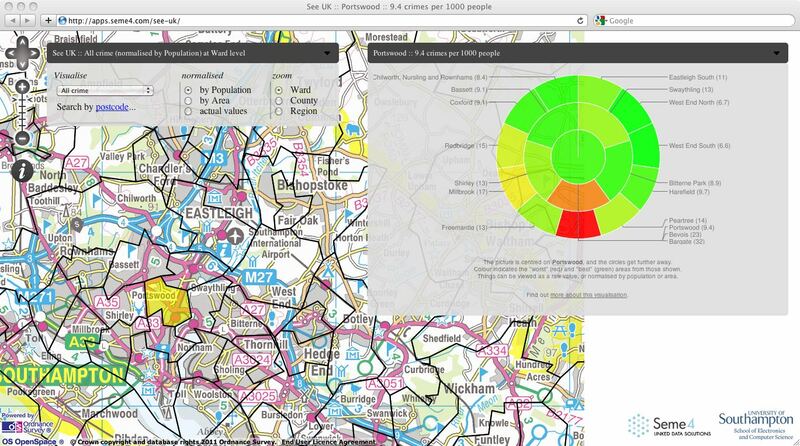 A simple viewer of some of the data at data.gov.uk, against an abstract view of the geography. The data can be normalised by population and area, giving more complex views than available with just the raw data. The picture is centred on the indicated area, and the circles get further away. Colour indicates the "worst" (red) and "best" (green) areas from those shown. Things can be viewed as a raw value, or normalised by population or area. Navigation can be achieved by clicking on the names around the pie chart, an area of the map, or an area of the pie chart (not Firefox or Internet Explorer). The use of "UK" is perhaps currently more aspiration than description. We look forward to having more inclusive datasets. See UK (http://apps.seme4.com/see-uk/) is a simple visualisation of data that has geographic aspects and has been published as machine-interpretable Linked Data. See UK uses data that has been sourced from data.gov.uk and processed into Linked Data where necessary, but is also designed to be able to use other sources where available. All the datasets are then enriched, by calculating area totals from point data and inferring aggregate values for regions that do not have explicit data values, and further enriched by establishing linkage between the datasets. These enriched datasets are available directly from the EnAKTing Project, and can be accessed using the links below. The visualisation provides a view centred on a chosen region of the specified size, and most noticeably gives a "pie-chart" that shows the viewer how that region compares with similar regions around it. It is thus designed to focus on the information most relevant to the user. Colour indicates the "worst" (red) and "best" (green) areas from those shown. This pie-chart is shown in preference to simply colouring the map itself, as a coloured map confuses the map features with the data being visualised. It also gives some context of the real geography involved, so that a full picture is seen. The user can navigate by looking and clicking on the pie-chart, or the map, and can thus move around using whatever view they are taking of the data presentation. A search by postcode functionality is also supported, aiding the user in finding specific locations. An important aspect of the visualisation is that cross-dataset correlation can be achieved and presented in a natural fashion, as the data can be viewed as normalised by population or area, in addition to the raw values. The user can therefore see how regions compare in terms of, for example, crime density by population or area, rather than just knowing that their county has little crime, and guessing this is because the county has a small population or area. See UK has been produced as a collaborative activity between Seme4 Ltd and members of the EnAKTing project, led by Prof Nigel Shadbolt, at the University of Southampton. For further details please contact Hugh Glaser or Ian Millard; feedback on this application is very welcome. The values for things like transport and education are the latest figures available; the figures for crime are from the monthly published figures. And please be aware that the app is only presenting the underlying data, and so may reflect anomalies and errors in quite a visual fashion. Because the sources are primarily England and Wales, the data for Scotland and NI is not available at many zoom levels. But at least it means that there is no crime in Scotland. However we still call it See UK, as we hope that the data will be there for everywhere! This a Semantic Web service, based entirely on data provided in Resource Description Framework (RDF), which is retrieved using the SPARQL Query Language for RDF. The backend storage is provided by a cluster of machines running 4store. The front end is written in PHP and jQuery, and the pie chart is provided by using the Google Chart API. The data here is presented as a best effort at visualising some complex datasets. As such, the source data may be wrong, the processing may have introduced errors, and the visualisation may go wrong or present a misleading picture. In other words, please do not rely on this, and we certainly provide no warranty or otherwise as to the accuracy of the service. This service is provided by Hugh Glaser and Ian Millard. It uses data from data.gov.uk (as permitted under the Open Data Licence), and the Ordnance Survey, (as permitted under the OS OpenData Licence). It has been processed and republished by the teams from the EnAKTing Project, led by Prof Nigel Shadbolt, (with special mention of Manuel Salvadores, Gianluca Correndo and Tope Omitola) and Seme4 Limited. The currently used raw, enriched, data can be accessed at http://crime.rkbexplorer.com/, http://transport.psi.enakting.org/ and http://absenteeism.psi.enakting.org/ and some of it can be accessed using the Linked Data API at http://puelia.psi.enakting.org. It runs on servers provided by the EnAKTing Project and Electronics and Computer Science at the University of Southampton. The pie chart is provided by using the Google Chart API and covered by their Terms of Service.